Elaine Hancock (Olney, United States) on 13 March 2019 in Landscape & Rural. From the archives. 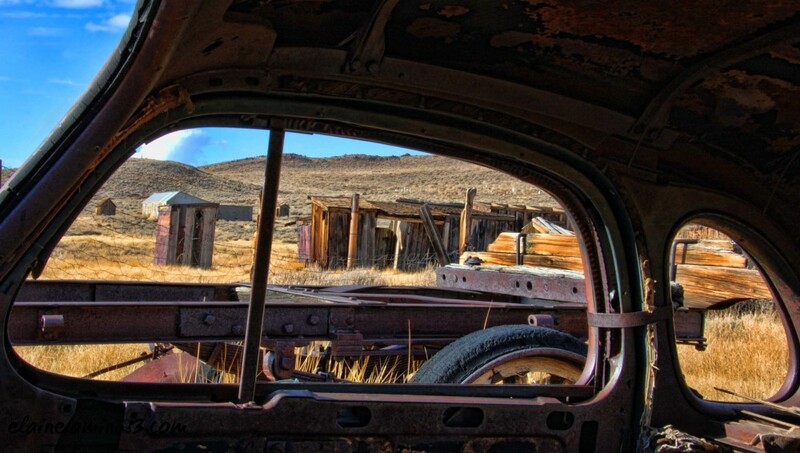 Taken in the ghost town Bodie. Excellente composition prise au travers les ouverture de la carrosserie, j'aime vraiment beaucoup. Olney in Illinois? , the city of origin? Wonderful !! Did you venture to visit this plce after twilight ? @Devi: No, only in the daytime. It is pitch black at night. But they do have photography groups that go there at night to take pictures of the moon rising over the town. Love how you filled the frame here. Top composing of this beautiful scenery. Really good! Cadrage au top à travers cette vieille voiture. Excellent chosen composition for this shot, a amazing photo as a result. Great framing. I took a photoshop class online and many of the example shots were from Brodie. I'd love to go there some day. @beach: It is definitely an interesting place. I have only been there twice but I found it to be fascinating. An eye-catching framed view through this car's frame!! Beautiful colors as well. SUperb light and framing. Clever composition. A beautifully framed image of this old place I must visit. @Jeff & Pat: Thank you so much. For me it is a learning process with more failures than successes! I remember some of your Bodie shots. It looks like a fun place to shoot. Super framing here. This is a fine composition through the chassis of a vehicle. The framing fits in with this scene very well.